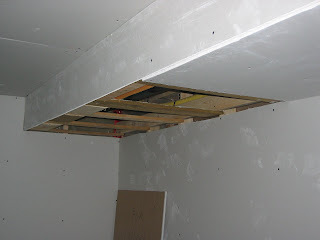 I can't drywall the bulkhead under the bathroom, or specifically the tub, until I connect the tub, because I need access to connect up the exposed supply lines. I can't install the exposed supply lines to the tub, until the drywall is complete in the bathroom so that I can install the floor covering. What we can agreed to do is precut the piece for the opening in the bulkhead which I can install myself latter. I still will have to install a access hatch for future winterizing access, however while big enough for doing the winterization, it will be way too small to do the plumbing connections.